The cannabis market is growing as fast as internet companies were in the 2000s and is set to deliver out sized returns for years to come. A recent survey revealed that 7.3% of Americans 12 or older regularly used marijuana in 2012, up from 7% in 2011. That's 7.6 million Americans that light up almost every single day of their lives. Countless millions of others use it occasionally. 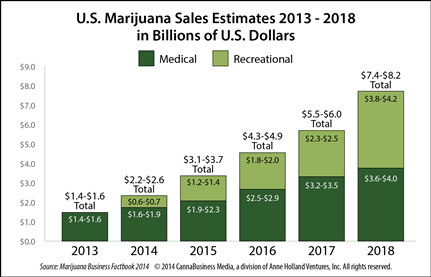 The North American cannabis market posted $6.7 billion in revenue in 2016, up a full 30% from 2015, according to a recent report from Arcview Market Research. That’s nearly $2 billion more than the experts were projecting in 2014. Legal Marijuana is here to stay, and marijuana investing will be the greatest moneymaking opportunity of our lives. You really don’t want to miss out on this mega-trend that can deliver life-changing gains. As an investor you should know, while states have been free to pass legalized marijuana laws, the federal laws still recognize marijuana as a schedule I controlled substance — which is still technically illegal. This means the Feds can go after legal cannabis companies if they so desire. While attorney general Jeff Sessions may talk a big game about cracking down on cannabis businesses we believe that is exactly what it is; just talk. One key takeaway from all of the fear surrounding a federal crackdown on marijuana? A massive buying opportunity. Since Sessions has made his thoughts known, stock prices have lowered (approximately 5-10%) - and they won’t stay low for long. If you had the opportunity to invest in alcohol right before the end of prohibition, would you do it? This is essentially the equivalent of investing in Budweiser right before the end of prohibition. And if the American people get their way, we could be witnessing the end of federal prohibition on cannabis very soon. The image above displays the results of a recent survey taken which shows that support for legalization of marijuana has reached 60%- an all time high. There certainly isn’t a better time to be a marijuana investor. If you are interested in getting started then we have a few recommendations that you may want to look into regarding the cannabis space. If you are unable to look past the lingering threat of Jeff Sessions and the federal marijuana laws, then we also have a variety of cannabis stocks that trade on Canadian markets that are just as (if not more) lucrative. When it comes to federal regulations on marijuana, Canada is a little ahead of the United States which makes investing in Canadian cannabis companies a wise decision from an investment standpoint. The following are proven marijuana stocks that have treated investors to substantial gains. In addition to the stocks listed here, the Outsider Club resident Marijuana Investing expert, Jimmy Mengel, has recently released new research regarding the marijuana trade. The future of the marijuana industry is extremely promising. There are so many opportunities that sometimes one can feel overwhelmed. Luckily, Jimmy does the legwork for you and finds the best stocks to help narrow your search. You can access his latest report here. Today we answer a question from a fan concerning what impact the Trump administration will have on the legal cannabis industry and its investors. How often have you hear of a millionaire or billionaire who struck it big on a "little-known company" that turned into a mega-giant?